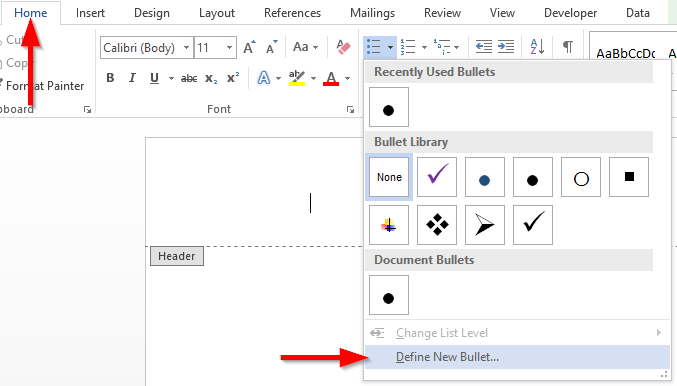 How to customize your bullet points color in Office 2016? I am creating a bulleted list in Word. By default, all bullets are colored black. is there are way to switch the bullets to a different color, say red? Sure Diane. Please read on this tutorial which is applicable for all Office 2016 applications. Open your word document, go to Home and click on the drop down box of bulletin in the paragraph menu. Click on Font in the bullet character. 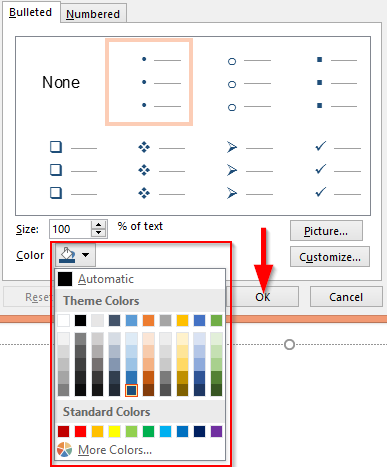 In the font color choose needed color for your bullet point and Hit OK.
Office does not provide bullet option in Excel and OneNote separately. So to use bulletin read the procedure below. Open your excel spreadsheet and select Symbols in the Insert ribbon. 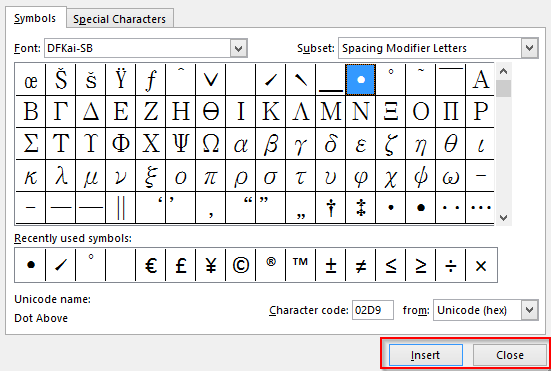 Select anyone of the symbols to use as a bulletin, hit Insert and select Close. Now select all the inserted cell, click on the bottom right of the cell and drag to insert the same bullet point to the other cells. To color the bullet point, select the inserted cells and click Home. In the font click on the drop down box of font color and select your needed color. 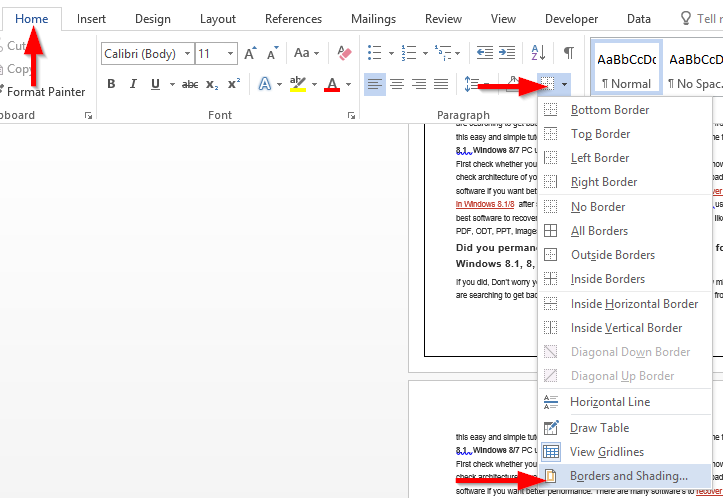 Open your OneNote, click on Insert and select the drop down box in Symbols to use it as Bullet point. 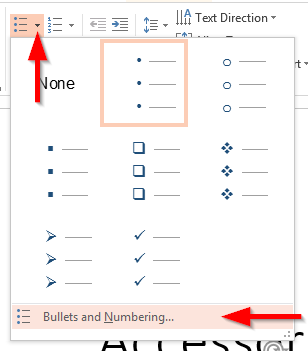 Select the Bulletin, click Home and select font color in Basic Text to change the bullet color. In your PowerPoint presentation, click on Home and select Bullet in paragraph menu. Now, click on the drop down box in bullet and select Bullets and Numbering. Click on the color and select your needed colors for you bullet point. Applicability: Office 365, 2019, 2016,2013. Windows operating systems. I used to read only Outlook mail in Outlook 2016. But I’ve heard that i can also use Outlook to access my Gmail and Yahoo Mail accounts. Is so, how to configure my Yahoo and Gmail mailboxes in Outlook 2016? Thanks. Read further to learn how to add your Yahoo and Gmail mailboxes into Microsoft Outlook 2016. Bonus: Download the step-by-step guide that will show you how to setup Gmail and Yahoo Email in Microsoft Outlook in less than 10 minutes. 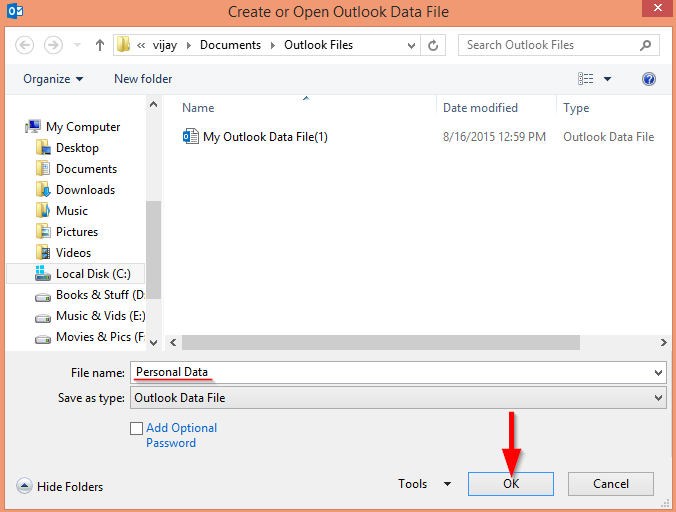 Open your Outlook 2016, click on File and select Add Account in Info menu. 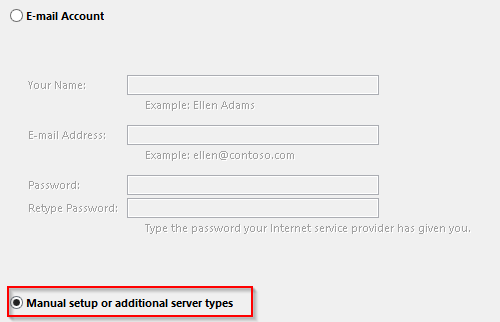 In the Auto Account Setup, check on Manual setup or additional server types and click Next. Then, check on POP or IMAP and click Next. First off, enter your Name and Email address of your yahoo account. In the Server information, set Account Settings as IMAP. Now type your Yahoo Account password in the Logon Information. Click on More Settings … select Outgoing service and check on Use same settings as my incoming server. Click on Advance menu and enter the following accordingly in the space provided. 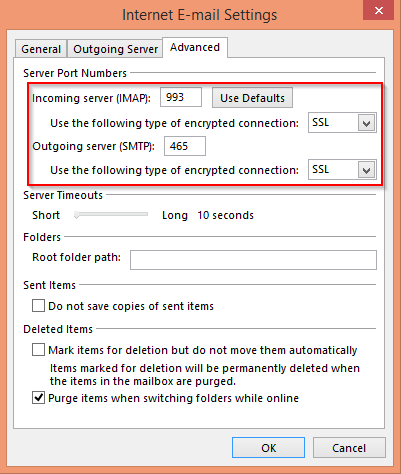 Enter 993 in Incoming server (IMAP) and select SSL in Encrypted connection. Enter 465 in outgoing server (SMTP) and select SSL in Encrypted connection. Click OK and select Next in Add Account dialog box. Done! you have added your Yahoo account in Outlook 2016. If you are using a MAC OSX operating system, you might want to look at our guide for adding GMail to Outlook on MAC. 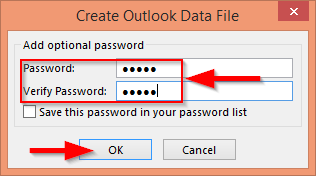 Open your Outlook, click on File and select Add Account in Info menu. Enter Name and Email address of your Gmail account in the given blank space. In the Server information, set Account Settings as POP3. Enter your Gmail Account password in the Logon Information. Enter 993 in Incoming server (POP) and select SSL in Encrypted connection. Back in Add Account dialog box, hit Next. First off, If you are running Office 2013 or older, you might want to switch to an Office 365 subscription. Microsoft is offering a nice deal that includes the Office applications + 1TB of storage starting $69/year. Sign up for your Office 365 here. Additional questions? Take a look at out guide to get your questions answered. How to recover deleted email in Outlook 2016? We all know how distressing is to find out that we might have accidentally deleted some important email from our mailbox and don’t seem to be able to find it. Luckily, Outlook comes well equipped to handle those situations. In this post we will discuss the various recovery option for deleted email in Outlook 2013 and 2016. Usually all our deleted mails from inbox will be stored inside the Deleted items folder. Hence we can recover it easily and move it back to our needed folder. Steps are given below. In Outlook, go to your Email folder and click on Deleted Items folder. Select the needed mail in the deleted items folder, click Move drop box in the ribbon. Click to which folder the mail has to be moved. Special Bonus: Download the Free PDF version of our Outlook 2016 Tips and Tricks guide. If unfortunately we have deleted the mail by using shift+delete, then the mail wont be saved in the deleted items folder. But there is another way to recover it. Click on Folder in the ribbon and select Recover deleted items. 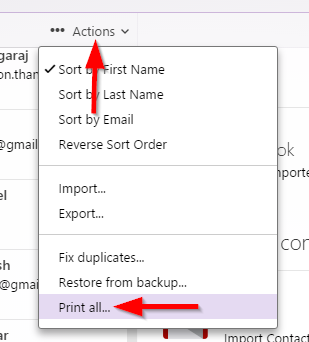 Select the mail which has to recovered and click Recover Selected Items. The Recover Deleted items option is only available when using Outlook with an Exchange account. Otherwise it will be greyed out. Also, it won’t be available if we work Outlook in Offline mode. Sorting is your friend: by using the Name and Deleted On columns we can sort out deleted email by its deletion date and time, subject or sender. This makes finding deleted email easier. 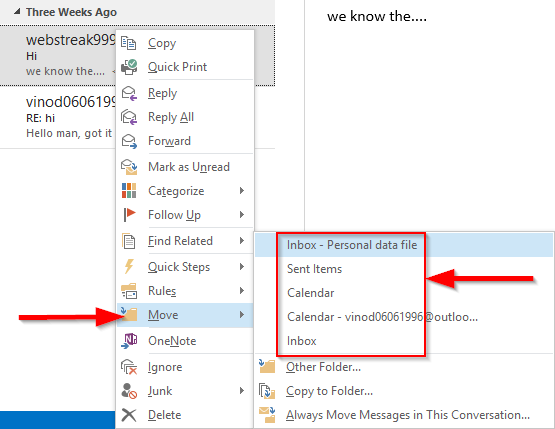 How to insert custom VBA macros into Outlook 2016 and 2019 e-mail messages? Applicable to: Office 365, 2016, 2013, 2010, 2019 ; Windows 10, Windows 7 operating systems. In Microsoft Office, we use Visual Basic for Applications (VBA) for creating custom programs that enhance Office’s basic functionality and saving user time by automating repetitive tasks. We refer tho these VBA program as Macros. Unlike other Office apps, Outlook doesn’t offer a simple Macro recorder that allows us to record user actions and auto-generates the required VBA code for us in the background. Therefore, if we want to add our own custom functionality to Outlook, we’ll need to learn to write simple VBA programs and incorporate them into our Outlook session. Note: If you are interested to know how the Office macro recorder actually works, i would recommend to look into the MS Word Macro recording primer. We’ll start by setting up your macro development environment. We’ll go through some of the most useful VBA scripts for Outlook. We’ll learn how to insert our custom VBA macro into the active Outlook Session. Next, we’ll go ahead and define a shortcut icon for our macro in the Quick Access Toolbar. This will allow the us to run the macro with ease. And we’ll finish by enabling Outlook macros and handling their security to ensure that the code will actually run when prompted in our computers. How to setup the developer tab in Outlook? 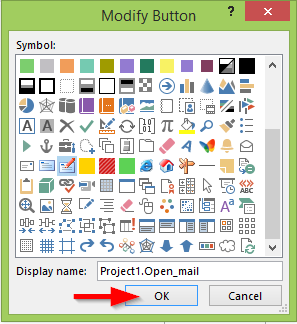 Open your Outlook, right click on the Ribbon area and select Customize the Ribbon. Check on the Developer option and click OK.
Now you can find Developer in the Ribbon and click on the Developer. Select Macros in the drop down box Macros. This simple snippet creates a new email message item programmatically; then it sets the to, subject, body text and CC fields. Finally it displays the message in Outlook so you can review and send it. 'Set your new message to, subject, body text and cc fields. .Subject = "Insert your message subject here"
.Body = "Insert your email text body here"
Advanced Note: You are able to use predefined Outlook templates when defining new emails with VBA. In order to do that, you’ll need to leverage the method CreateItemFromTemplate and specify the location of your oft file. If you want Outlook to send out the email you have just created automatically, you can add the following line to the code posted above. Paste the following line before the End Sub statement. .Subject = "This is your message subject"
Please ensure that you set the correct path and attachment file name in the snippet. In this example i have set multiple recipients to the email. The following snippet, creates a task and assigns it to another individua and sets the task subject and body text. .Subject = "This is your task subject"
.Body = "Insert a thorough explanation of your task here." Few readers asked how to automate saving emails to HTML. The code below accomplishes exactly that. Note: Ensure that you launch this code only on open emails. 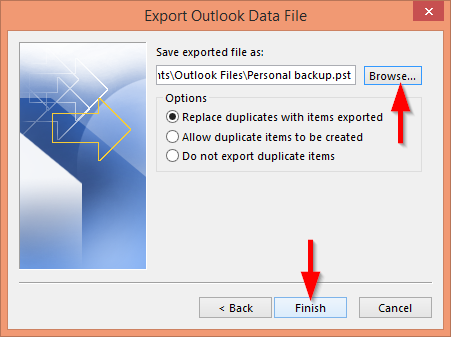 FilePath = Environ("HOMEPATH") & "\Documents\" & "\"
How to use VBA Macros in Outlook? For this example, we’ll use the following Visual Basic macro code which allows to create an e-mail message programmatically. First off, Open Microsoft Outlook. The VBA developer IDE will be opened. Expand the project tree until the ThisOutlookSession node. Right click ThisOutlookSession and then hit Insert. You’ll now going to inset a Visual Basic module. Go on and select Module. Paste the code above into the Module window. Hit File then select Save. Go ahead and close the Developer tab. This will bring you back to your Outlook user interface. Where are Macros stored in Outlook? Unlike in Excel for example, which allows you to store macros in the personal.xlb file or in specific spreadsheets; all Microsoft Outlook macros are stored in one global file in your file system: VBAProject.otm. The file can be found at: C:\users\<your_user_name>\AppData\Roaming\Microsoft\Outlook. How to create an icon for your macro? Our next step is to insert a small button which will allow us to easily run the macro. For simplicity, we’ll insert this button to the Quick Access toolbar. Open Microsoft Outlook, if it’s not opened yet. Right click on the upper Outlook Ribbon and select Customize the Quick Access Toolbar. Note: You can use a similar procedure to place your icon in the Ribbon itself instead of in the Quick Access Toolbar. Hit the ‘Choose commands from‘ combo box and select Macros. Select the macro you just created and hit Add. Hit Modify to define a custom icon picture for your Quick access toolbar button. How to enable a macro in Outlook? This step is optional and should be followed only if you receive an error message when running your newly created macro. Next is to allow Outlook to run our VBA macro. By default, Microsoft Office disables macros and doesn’t allow them; so we’ll need to define the proper macro security to allow your custom Outlook macro to run. In Outlook 2016, click on Developer in the ribbon and select Macro security. Also if needed you can assign notifications for only digitally signed macros and can also have notifications for all macros (Recommended). How to run your Outlook macro? Last but definitely not least, now it’s time to run your newly created macro. Navigate to the Quick Access toolbar (upper left hand side of the screen – slightly above the HOME menu). Hit the icon you have assigned to your macro. Voi’la, you have just completed your (first) Outlook VBA macro! Need specific VBA help? Feel free to contact us. Got a related question? Look into our guide to get your questions answered or feel free to leave us a comment. How to create and add your own page border to a Word 2016 and 2019 document? I am using Microsoft Word to prepare a summary document for a project i am about to hand at university. 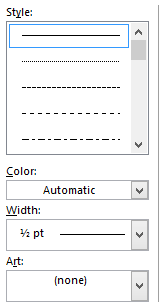 My question is related to adding borders into Word.. Is there a way to create a boxed page and put it in my document? I need to have an outside decorative four sided border in all my doc pages for the project review. Yes, tou can definitely add a custom box border in your Word document pages and glad that we could help. Note that you can define several border styles and apply them to different sections of your doc, so that the first page has a custom look and feel. Read further for the detailed procedure. Open your Word document, click on the Border drop box in the paragraph ribbon and select Borders and Shading. Select the Page border, in the setting select how your border should be. Click on your preferred options: None, Box, Shadow, 3-D.
Also we can use the Custom option where we can choose where the border line should be in the page. The selection can be done with the use of buttons available in the Preview option. Style option allows us to choose how the lines should be, like dotted lines , double lines and so on. Color lets us to choose the color of the border line, Automatic color will be Black. Width is the Border line width and can be adjusted accordingly to our opinion. Art helps us to decorate the page border with some arts. Applying page borders can also be done in the same Borders and Shading by selecting the Apply to drop down box below the preview. Whole document allows us to use the same border in the each page of the document. This section allows us to only use the border for the particular section till we close the document, so the next time we use the document will not be inserted with a page border. This section – first page only allows to insert the page border in the first page for the particular section. This section – all except first page allows to insert page border to all pages except first page for the particular section. That’s it, we just added a border to our word document. Thanks for reading! How to remove the weather section from Outlook 2019, 2016 and 2013? Microsoft Office 2019, 2016, 2013; both 365 and standard distributions. Yep, one of the new features introduced in Outlook 2013 is the display of a simple weather conditions forecast in your calendar header. For me, that’s quite a nice feature, as it saves me a time to lookup weather forecast conditions in Accuweather, Weather channel and so forth. That said, removing the bar from Outlook is pretty straightforward fortunately. In Outlook 2013 or 2016 , hit on File. In the Outlook Options dialog, select Calendar. Scroll to the bottom of the dialog and uncheck the ” Show weather on the calendar” box. Your weather bar won’t be displayed in Calendar. In that same dialog you are able to determine the Outlook weather settings; so that you can (for example) display the weather in your favorite vacation location in your calendar :-). Hit Outlook, then Preferences, then go ahead and select Calendar. The weather section comes enabled by default, however, if it happens to be disabled in your installation, you can add it back quite easily. All you’ll need to do is to proceed as indicated above. he only difference is to check the “Show weather on calendar” check box, and that will do the trick for you. Got a related question? Look into our guide on how to get your questions answered. How to setup a distribution list (contact group) in Outlook 2016? If you often send out email to large audiences, for example the other students in your class, you might want to consider setting up an Outlook distribution list (referred also as Contact group). The biggest benefit for you is that when sending email, instead of typing your recipients addresses one by one, you’ll just send an email to one recipient – your class distribution list. Let’s see how that works. In Outlook, navigate to the Home tab. Hit the small arrow next to New Items, hover on More Items and select Contact group. In the Name field, Provide your distribution list a meaningful name. Here you can select email addresses from your Outlook Contacts, Address Book, or just type addresses from scratch. This might include your contacts from Facebook, Linked in and other social networks, if you have synced them to Outlook. Corporate users might be able to select also recipients from their Exchange Global Address List (GAL). Note that you are able to Remove Members as needed from the list. Your distribution list is ready to be used. Note for Business users: unless provided permission from your Exchange Administrator, you won’t be able to share the list of others in your company. Hit the To, CC or Bcc buttons as needed. Pick your newly created contact group and hit OK.
Write and send your email and that’s it. How to duplicate meetings, appointments and events in your Outlook calendar? Applicable to: Outlook 2019 / 365/ 2016 / 2013 / 2010; on Windows computers. Quite often i need to create a few instances of the same meeting requests in Microsoft Outlook. Are you aware of a simple way to duplicate a occurrence of an Outlook appointment by using copy and paste, as creating a meeting series for scheduling a few meetings might be somewhat of an overkill. Help is highly appreciated! Thanks for your questions. Keep those coming! You can easily copy and duplicate meeting entries in your Outlook calendar by highlighting the meeting in your calendar view and simply copying it by hitting Control+C , and then paste it to your preferred time by hitting Control+V . An alternative method is to simply right click your meeting in Calendar and drag it to the right time slot. After doing this, make sure to review your meeting subject, location and invitation content as those might have changed. When using this at work on Microsoft Exchange server, you also might need to review the list of attendees and their availability, as people might be tied in other meetings. If applicable, go ahead and check the availability of a meeting room and any other equipment/resources for your meeting. 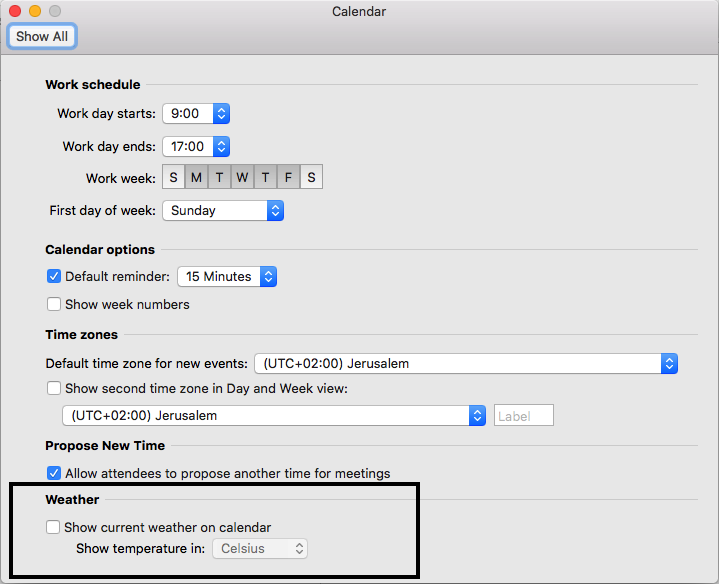 Duplicating appointments and meetings within the same Outlook calendar is not supported in Microsoft Office for MAC OSX. Using the same process you can duplicate a meeting across multiple calendars defined in your Outlook client. Outlook allows you to copy an entire calendar including all appointments, meetings and events. Navigate to the Calendar Tab. In your left hand side tab, under My Calendars, find the calendar you wish to duplicate. Right click the calendar and select Copy. Select the target Outlook folder into which you would like to paste the calendar. Now, return to My Calendars section and check the new calendar so that it becomes visible in your Right hand side pane. In Outlook, open the Calendar tab. Locate your meeting/event/appointment in the relevant Outlook calendar. Open the meeting by double clicking it. Copy the relevant names in the “To” field. Hover to the relevant date and time in the calendar and create a new Meeting Request. Now copy the relevant invitees to the To window. Enter your meeting subject and location. A couple of readers asked whether there is a simple process for creating a meeting or appointment from an email they got into their inbox. This is pretty helpful as it could be used to improve your follow up on important email. Here’s is a quick trick to accomplish that: in your Outlook inbox locate the email you would like to turn into an appointment, left click it and drag it to the Calendar tab in the bottom of your screen. Outlook will immediately open an appointment, that will have the email text copied into the appointment details. From there, go ahead and set your subject, locations and invited people. Give it a try and let us know in case of any question. How to import contacts and friends from FB and LinkedIn to Outlook 2016 and Outlook.com?? In today’s productivity tip, we’ll learn how to quickly export your LinkedIn and Facebook profile contact people into a file, so you can then maintain a clean, consolidated list of people you are in touch with. This will allow you to export and backup your contacts list and obviously use your contact email addresses for email communication via Outlook or Outlook.com. Open your LinkedIn account, move your cursor to Connections and select Keep in touch. Click on the right side Settings. 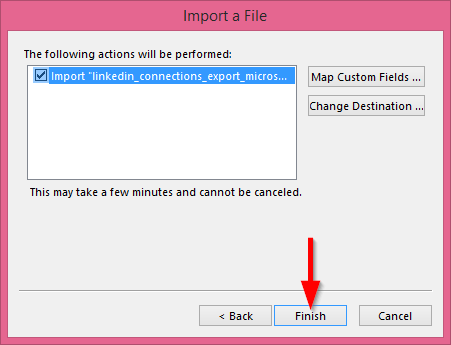 Then select Export LinkedIn connection in Advanced settings on the right side of the page. 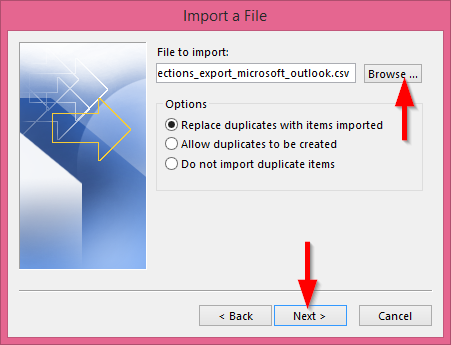 In the drop down box, select Microsoft Outlook (.CSV file). Click Export and do the Security verification to download the CSV file. The simplest way to export your Facebook email addresses is by leveraging the integration with Yahoo Mail. First off, login to Yahoo email. After that, hit on Contacts on the left side of the Yahoo mail. Accept the Importing permission from Yahoo in Facebook. Now you can see that all contacts in Facebook are imported to Yahoo. Click on the Action, select Print and copy all the text. Paste the text in a Excel and save the document is CSV format. Open your Outlook 2016 and hit File. Select Open & Export and click Import/Export. 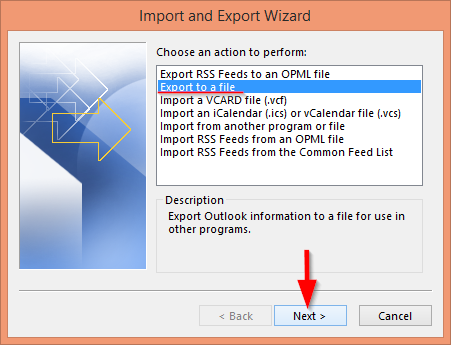 In the dialog box, select Import from another program or file and click Next. 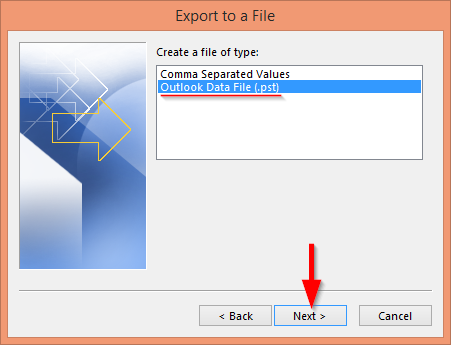 In Select file to Import from, click Comma separated values and select Next. Then, browse for the downloaded CSV file and click Next. Select the Destination folder and click Next. A dialog box showing ‘The following actions will be performed‘, click Finish to add LinkedIn contacts. 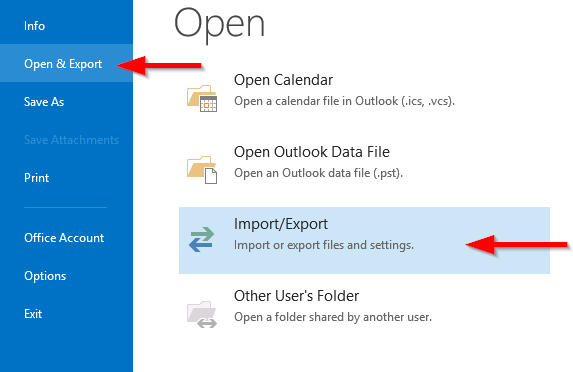 Open your Outlook account, click on the box on left side and select People. In the Import Contacts, select Start import. In the ‘Where would you like to import from?’, select Other. Hit Choose File and point to your contacts spreadsheet. You are done, thanks for reading! 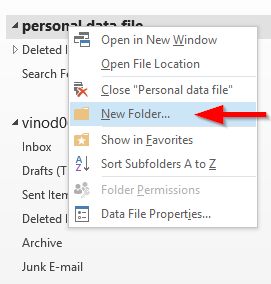 How to define and use personal data folders in Outlook 2019 / 365 / 2016? Applicable to: Office 365, 2016, 2013, 2019; Windows 7, 8 and 10. Greetings Easytweaks team! A co-worker told me that he is using pst files in order to keep backups of his email box, calendar, journals and contact people. Could you elaborate more about how to insert Outlook data files and using them for daily archiving of my mailbox? I love MAC OSX Sierra and wish to use Outlook on the MAC, so i guess other question i have is whether i can use pst on MAC OSX. Many thanks! Outlook personal folders are very useful as they allow us to create offline copiers of our mail, contacts and tasks for offline access, data backup or transfer to a different computer. Personal folders are represented in the Windows operating system by the .PST suffix. In this guide we will learn how to create and open personal folders, as well as export your email to a PST file for backup. 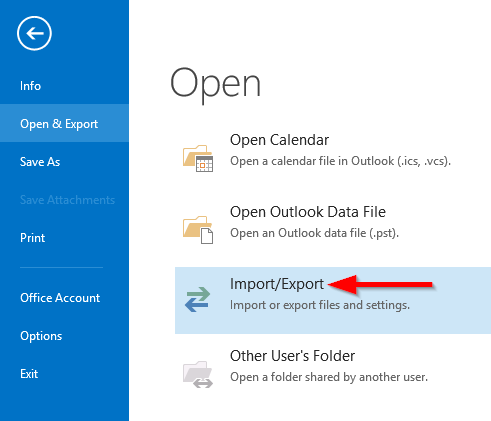 We’ll first teach you how to create Outlook folders using the Open/Export wizard. This will allow you to package all existing email / contacts and calendars in one shot. For advanced users, we’ll describe how to create the pst files manually. Once you have defined the data file, you can go ahead and populate your personal folder with specific email, calendars and contacts to it. Keep reading for the details. Go to File, hit Open & Export and select Import/Export. In the opened dialog box click Export to a file and click Next. Select Outlook Data file (.pst) in Create a file of type option and click Next. Now, select the mailbox you would like to export. If you are interested to export your calendar or contacts, select the relevant folder in the Export Outlook Data file screen. Select the location of your backup file and hit Finish. Last – Enter a Password and Verify password for the backup file. Also enter Password to open the backup file. Open your Microsoft Outlook 2016 (or Office 365 and Outlook 2013), hit Home and select New item. 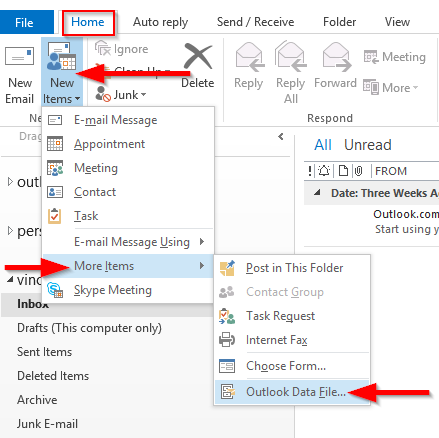 In the drop box move the cursor to More items and select Outlook data file. In the dialog box, enter the File name and Save it in your location. Note the location of the .PST file as you might want to later on copy it to an external backup device. Now, you’ll personal folder is created with Deleted Items and Search Folders sub folders. To add more sub folders, right click on the personal folder and click New folder. Enter the name and press Enter key to create sub folders in your Personal folder. Couple of readers asked us about looking up for those .pst file after creating them. The easiest way to find your files is simply by searching for *.pst in Windows Search. Open your Server mailbox and right click on the mailbox that has to be moved to your personal folder. Hit Move and select the folder to be moved to. The selected email folder or items will be moved. Does MAC OSX use pst files? Microsoft Outlook for MAC doesn’t use Outlook Data Folders. That said, it’s definitely possible to import pst files created on WIndows to Outlook for MAC. Got additional Outlook related questions? If so, take a look at our guide on how to get your questions answered.